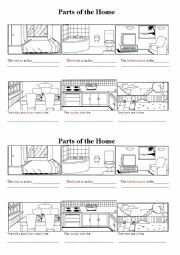 Practise the objects and rooms in the house. You can cut this worksheet in two parts. Smaller the students like it more. 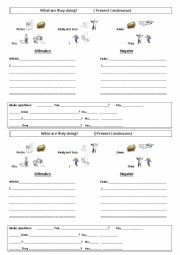 This worksheet was created to practise present simple and present continuous tense. 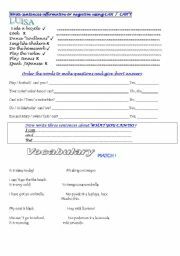 It helps students to learn how to use adverbs of frequency and give personal information. It�s very simple but effective at the same time. I hope it is helpful ! Describing animals ! Use of CAN or CAN�T, parts of the body, colours... I hope it is useful. Names of animals, colours, ability, parts of the body. 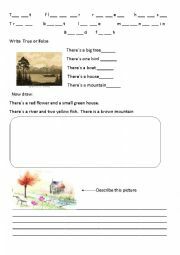 A worksheet to be used in class. Hope you like it. 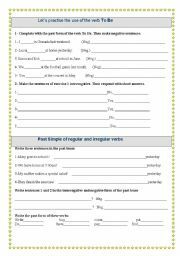 This printable is intended for the practise of the verb To Be in past tense. 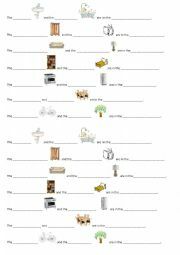 We can also practise the past tense of other regular and irregular verbs. Six basic/easy classroom words. They can write the words again bellow after filling the blanks. Besides, you can ask them to colour each object in a different colour. 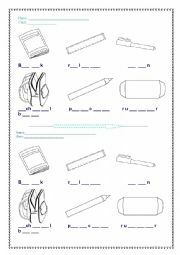 The worksheet is intended to be cut in two parts so it�s easier for little children and we save material and protect the environment. Thanks ! 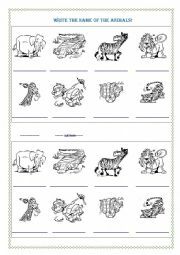 Write the names of the animals. 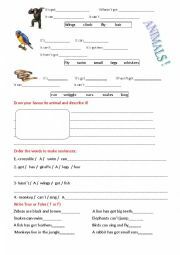 It can also be used to compare or describe animals, practice directed colouring and other activities. Hope you like it. Practise the outdoor vocabulary on elementary level. The vocabulary is combined with the use of There is and There are. Good to learn how to describe a pinture! 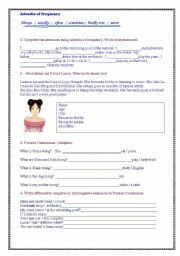 A worksheet to practise the Present Continuous tense !